Sometimes we humans like to think that we have a stone cold lock on this aging thing. 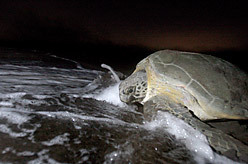 In fact, we’ve got bupkus compared with sea turtles. The Christian Science Monitor also as a great slide show on the topic. Consider the case of Adwaita the tortoise, who once belonged to the British colonial general Clive of India in the 18th century. One Wednesday last month, Adwaita was found dead in his enclosure in Alipore Zoo. His death was not unexpected – his shell had cracked some months before and a wound had developed, and he was, after all, somewhat advanced in life: West Bengal officials said records showed Adwaita was at least 150 years old, but other evidence suggested he was more like 255. It will take carbon-dating of his shell to determine his true age. At 255, Adwaita would beat Harriet the Galápagos tortoise, who was reportedly collected by Charles Darwin, and died aged 175 in 2006, and Tu’i Malila, the radiated tortoise given to the royal family of Tonga by Captain James Cook, and who passed over aged 188 in 1965. Here is a great rundown on how climate change is likely to impact the ancient mariners. Even the New York Times has a take on the issue. Taking note of the title of the NY Times article, “All but Ageless, Turtles Face Their Biggest Threat: Humans” I think we might share something with those turtles – the biggest threat to humans might just be humans.